Support Portal Home » Hosting Guide » Let's Get Started » Domain Names: Buy, Sell, Manage » How Do I Manage the Domain I Bought from HostGator? Many places will refer to name servers as either nameservers or name-servers, or sometimes simply refer to them as DNS. 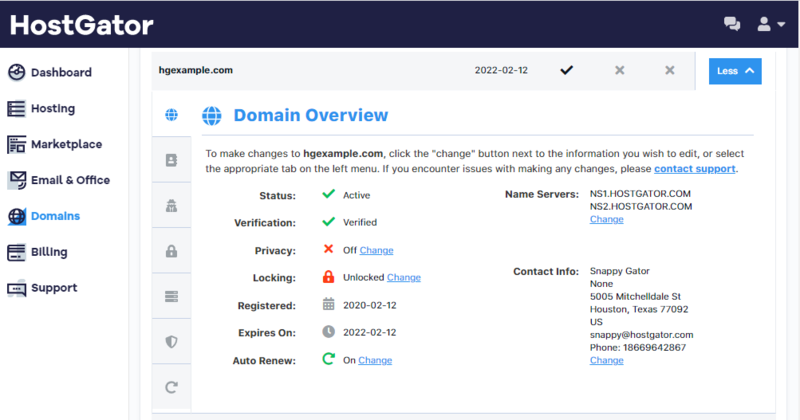 If you are ever directed to register private name servers or private nameservers, or update or change your nameservers or name-servers and your domain is registered with HostGator, this article will assist you with making those changes. Enter the domain name into the domain: field, and click the Click Here link to receive the password at the email address set as the registrant email address in the WHOIS of the domain. If you are still unable to recover your domain name, please contact us via phone or Live Chat to attempt to recover your domain. You will be asked for your billing email address and password to access any domains attached to that billing account. If you are unsure of your password, click the Forgot your password link below the login fields. Once logged in, click on Domains. Note: There is a $14.95 yearly fee for Domain Privacy. When you click on a domain name, the Domain Overview window will open and show more details and options for the selected domain. Contact Info - This section is to edit the contact information for the domain. Domain Privacy - This section is to enable Domain Privacy which will protect your personal domain registration information from public WHOIS searches. Name Servers (sometimes called nameservers or name-servers) - This section is to edit the name servers which the domain will point to. There is also a drop-down box that will automatically point the domain to any active packages on the account. Please remember that name server changes can take 24 to 48 hours to propagate. Currently, we can setup a URL redirect for any domain without hosting, for no extra fees. The name servers must be set to ns1.launchpad.com, ns2.launchpad.com, ns3.launchpad.com, and ns4.launchpad.com. Once this is done, please contact our Billing Department via phone or Live Chat to tell us which domain you would like redirected and to where. Domain Locking - This section is to unlock the domain, allowing it to be transferred to any other registrar. 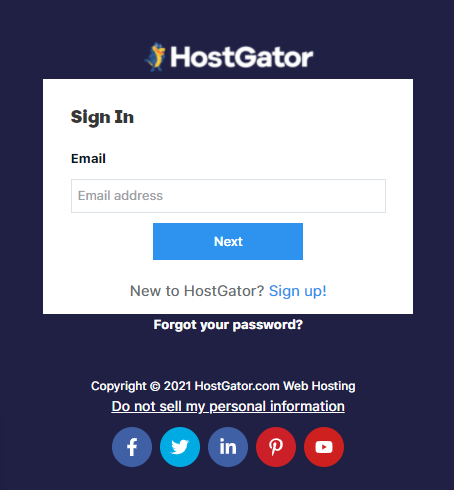 Any domain registered with HostGator will be locked by default. Auto-Renew - This section is to set the domain to either automatically renew, creating an invoice 30 days before it's expiration, or set the domain to cancel on the next renewal date. Any domain registered with HostGator will be set to automatically renew by default. If you have any questions, or if you require further assistance, feel free to contact us via phone or live chat, and we will be happy to assist you!